Craig Douglas McCracken (born March 31, 1971) is an American animator, responsible for the Cartoon Network cartoons, The Powerpuff Girls, as well as Foster's Home for Imaginary Friends. Born in Charleroi, Pennsylvania his family moved to Whitter, California after McCracken's father died when he was seven. He went to the California Institute of Arts, where he formed a strong friendship with Genndy Tartakovsky and Rob Renzetti (My Life as a Teenage Robot). The friendship is evident in the cooperation between series. After graduating he got his start on 2 Stupid Dogs. He created a cartoon called "Whoopass Stew," and the idea eventually became The Powerpuff Girls. There was also a short lived project on Cartoon Network he and Rob Renzetti created called Cartoonstitute, which was supposed to be a successor to the What A Cartoon! Show on TV, but it got put quietly on CN's video service instead. He left Cartoon Network in 2009, and later worked on Wander over Yonder, which got picked up by the Disney Channel and premiered on September 13, 2013. That show was canceled after two seasons due to Executive Meddling, a first for McCracken (He left after the fourth season of Powerpuff Girls which carried on without him for two more seasons. But was allowed to do a special which closed out the original run of the show, and he voluntarily ended Foster's... after six seasons). He is currently producing a show named, Kid Cosmic for Netflix, to premiere in 2020. He is married to fellow animator Lauren Faust. The two met when she joined the writing staff of Powerpuff Girls in season three and have since collaborated on all of his subsequent shows. They presently have one daughter together. He also has a Deviantart page , a Twitter , and a Tumblr . Wander over Yonder. His first series to be produced for a company outside of Cartoon Network, and to date, his only series to be canceled rather than willingly ended. Kid Cosmic, produced by Netflix. The '60s: He missed the decade by a year but a lot of his works are heavily influenced by it. Art Evolution: While his personal drawing style hasn't changed much over the years, his preferred animation techniques have. Foster's... saw him move from traditional hand-drawn animation to 2D computer animation, which allowed for more fluid character animation on a TV budget and better complimented his draftsmanship (by his own admission, he's a better designer than he is an animator). Wander over Yonder continued the technique, but switched from Flash to the more reliable ToonBoom. Animesque: The Powerpuff Girls was basically this mixed with heavy UPA /Hanna-Barbera influence. Author Appeal: Star Wars and Japanese animation are frequently referenced in his work. Author Avatar: Mac from Foster's is unintentionally a bit based on himself as a kid. He eventually rolled with it. Getting Crap Past the Radar: Like fellow Hanna-Barbera producer Genndy Tartakovsky, he enjoys this trope. The Radar entry of The Powerpuff Girls page is an excellent example. No Hugging, No Kissing: Seems to prefer this rule in his cartoons and also seems to dislike when his shows' fanbase gets too into Shipping. No-Neck Chump: His first student film, No Neck Joe, was nothing but what he considered to be "the lamest, stupidest jokes you could make about not having a neck." Sliding Scale of Idealism vs. Cynicism: Mostly middling, but heavily towards the idealistic end, albeit with a heavy dose of Black Comedy to balance it out. Wander over Yonder was even described as being "love versus hate." Thick-Line Animation: His Signature Style. Both The Powerpuff Girls and Wander Over Yonder used this. It's inverted with Fosters which is done in a mostly lineless style. Wild Hair: Most often portrayed with very curly hair. 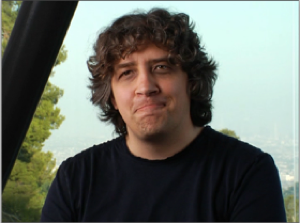 In the making of documentary for the The Powerpuff Girls, storyboard artist Paul Rudish even joked that Craig looked like the missing crew member for Goober and the Ghost Chasers when they first met.